The festival, presented by Jax Fish House & Oyster Bar, returns next Wednesday, March 2 at Boulder Theater. There is sure to be a whole lotta Shuckin’ goin’ on during the biggest oyster celebration in Boulder County. The fourth annual High West Oyster Fest (#HWOF2016) is said to bring forth “an Intergalactic Shucking & Eating Championship celebrating the glory, deliciousness, sustainability and abundance of oysters” as described on the event’s Facebook page. 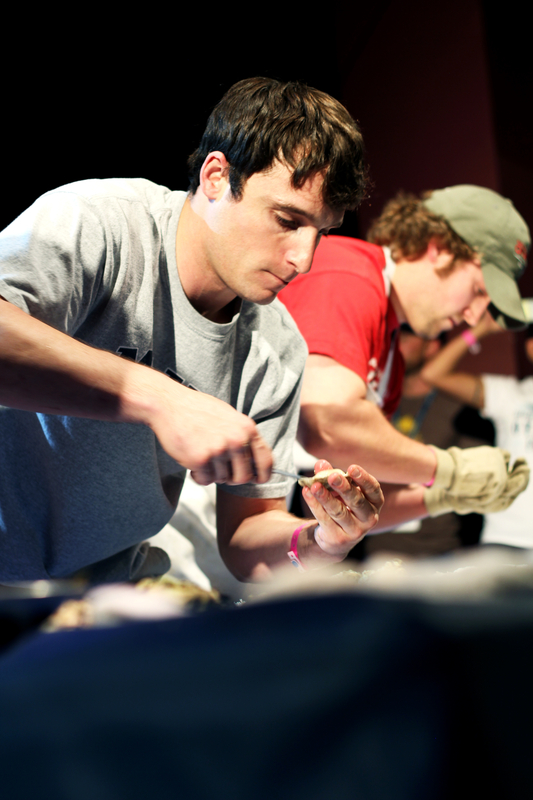 High West Oyster Fest features an Oyster Shucking Contest. Photo by Jax Fish House. Jax Fish House and Big Red F Restaurant Group are presenting this year’s festival along with Tebo & Burgermeister as title sponsors, with additional sponsorship by Jax partners Northeast Seafood, the “wildly respected Croxton cousins” and their team at Rappahannock River Oysters, and Boulder Daily Camera. In addition to drinks and music, guests can enjoy witnessing an Oyster Shucking or Eating Contest, or indulge in Jax Food Favorites including Oysters on the Half Shell, Peel n’ Eat Shrimp, Chicken & Crawfish Gumbo, Chicken & Sausage Jambalaya. High West Oyster Fest is the official start to Oyster Month, Jax’s month-long celebration (and education about) of the illustrious oyster. Jax is dedicated to sustainability, and during the month of March, Jax patrons can look forward to weekly specials inspired by oyster-loving cultures from across the globe as well as an expanded mignonette menu and traditional raw bar offerings including the Emersum Oyster, which was cultivated exclusively for Jax Fish House by Virginia’s Rappahannok River Oyster Co.
High West Oyster Fest is the kickoff celebration of Jax Fish House’s Oyster Month. 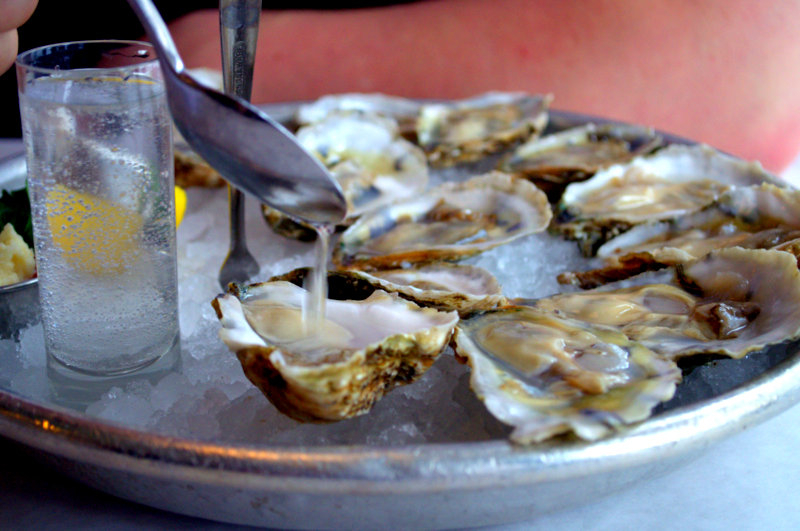 The Jax menu will featuring the Emersum Oyster, which was cultivated exclusively for Jax Fish House by Virginia’s Rappahannok River Oyster Co. Photo by Jax Fish House and Oyster Bar. “This perfectly balanced oyster has consistently sweet, salty, and creamy qualities, and is sustainably grown and harvested at a specific point in the Chesapeake Bay, giving the Emersum its own ‘merroir’,” organizers wrote in a press release. In addition, Jax will donate 10 cents to local charities for every Emersum Oyster sold throughout the month. Additionally, each of the four Colorado Jax Fish House & Oyster Bars is also pouring pints of Emersum Oyster Stout, a collaboration brew between Jax and Odell Brewing Company in Fort Collins. This year’s festival changed its date to March 2 in order to avoid competing with the Colorado caucuses and will feature a Jax Fish House pop-up Raw Bar, oyster shucking and eating competitions, and great tunes by Denver DJ Styles Davis with 100% of proceeds benefiting the local nonprofit Blue Sky Bridge. 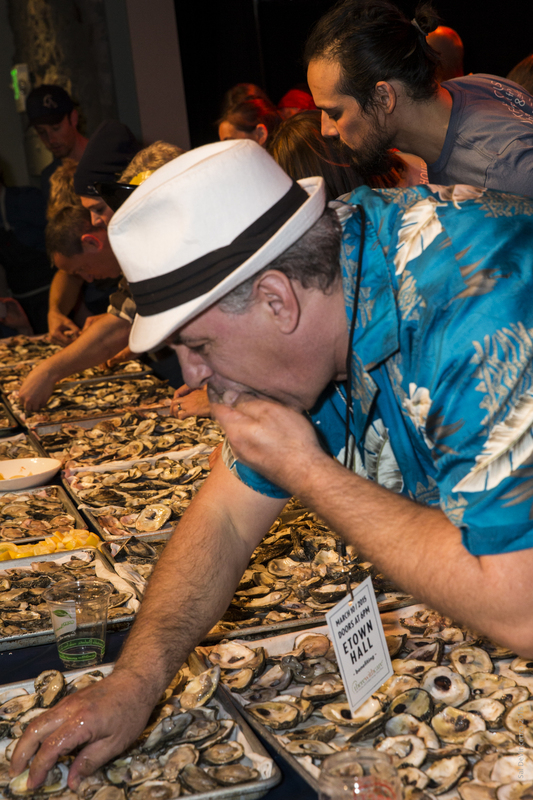 HWOF also features an Oyster Eating contest. Photo by Jax Fish House. Blue Sky Bridge, founded in 1995, is an accredited Children’s Advocacy Center that provides forensic services to children for whom abuse or neglect is reported as well as counseling and other support services for non-offending family members. Blue Sky Bridge is the only victim assistance agency of its kind in Boulder County. Its mission is to “facilitate a collaborative approach to child abuse investigations while providing child victims and their families with support in a safe and child-focused environment. We strive to make the community safer for all children and families through intervention, education and advocacy.” Organizers added that last year’s High West Oyster Fest raised $590,000 for There With Care, a local non-profit that offers support and assistance to families with children facing serious illnesses. The Fest kicks off at 6 p.m. at Boulder Theater and patrons can enjoy food, drinks and entertainment until 9 p.m. Tickets are $35 for adults, $15 for children (12 & under), and $20 for students with a valid I.D.